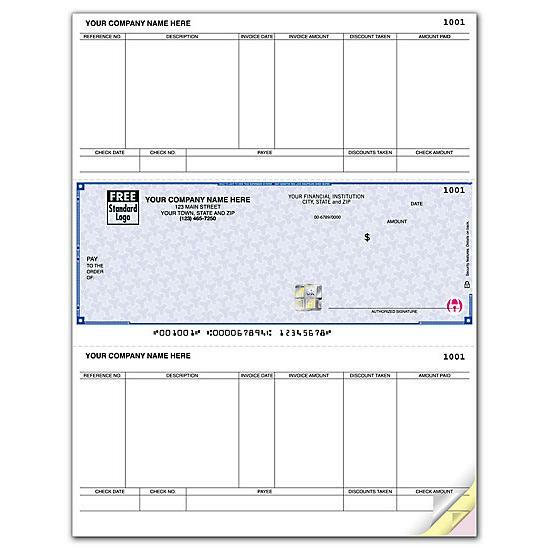 Size: 8 1/2 x 11"
1 check per page - Order checks online now! Deter, Detect and Defend against check fraud with High Security Checks. Trusted by 7,000 financial institutions nationwide, the High Security Laser Checks offer the highest level of check security and include security features, making it the most secure check available. 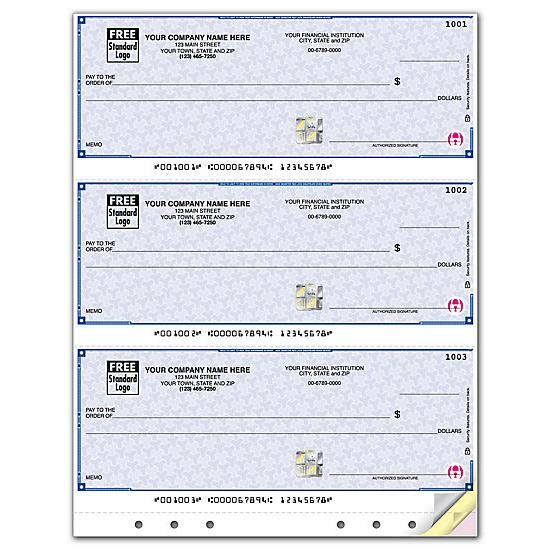 These laser checks are compatible with Peachtree Versions 2006 & Newer. 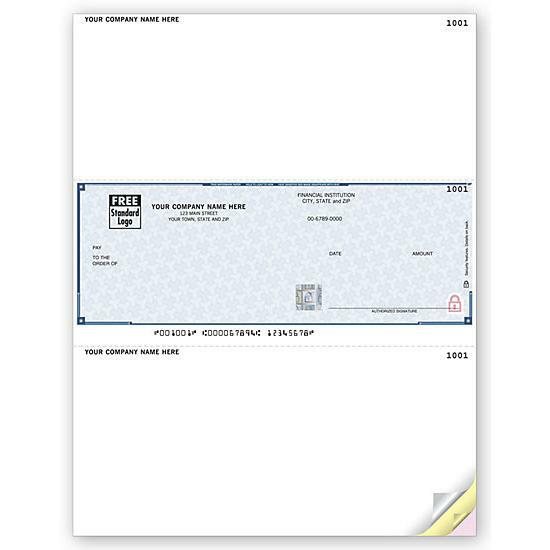 These popular checks allow you to pay multiple business invoices with 1 check! 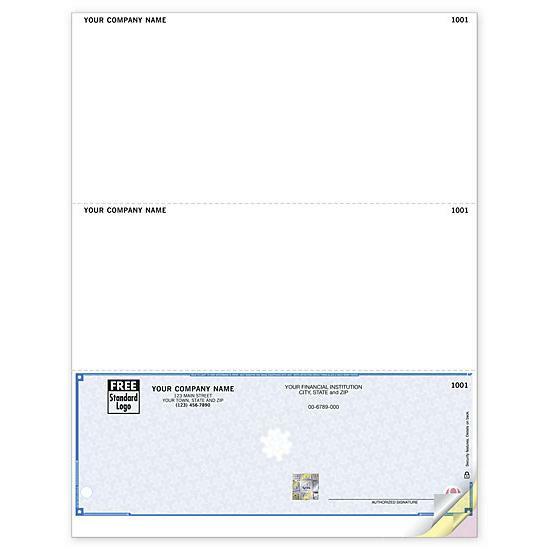 Top & bottom tear-off vouchers include preprinted headings for a clear, detailed payment record. Security features! Anti Copy Technology. High Security Checks are made with technology to prevent most copiers from creating a usable copy. Safety Hologram: Multi-dimensional foil seal hot stamped to check stock cannot be photocopied and includes 7 security features. Visible Security Features: Heat-sensitive ink, visible embedded fibers, chemical-wash detection area and true watermark. Built-in Check Security: Chemically sensitive paper, microprint border, invisible fluorescent fibers, erasure protection, security screen & warning box. Numbering Systems: Choice of consecutive (face up) or reverse (face down) numbering, depending on your printer setup. Printer compatible: Sheet format fits all standard laser & inkjet printers; multi-part options include up to 2 color-coded duplicates on separate sheets. Free Personalization: Include your business imprint plus choice of standard check color, typestyle & standard business logo. Additional customization also available at an additional charge. Proprietary screening: All orders go through proprietary screening to prevent unauthorized orders.